What will he remember? 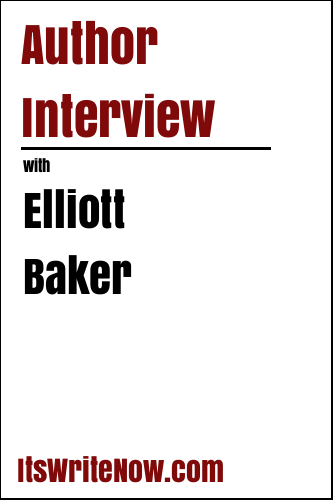 To explore the memories of ‘The Sun God’s Heir: Return’, author Elliot Baker has returned to ItsWriteNow.com to chat with me about his book, writing, and some wigglier concepts that we’ll get to later. Elliot, thanks for coming back to chat with me, I love catching up with authors to find out how they are progressing in the writing world. For those readers who haven’t read our last interview, can you bring everyone up to speed by sharing a little of the Genesis story behind ‘The Sun God’s Heir: Return’? The Sun God’s Heir began as a dream. Sometimes dreams are remembered whole when you wake up. This has only happened to me three or four times and it was years before I acted on this one. When I awoke, I had the protagonist, the antagonist, the setting and the main plot. Not the ending, but the beginning, the prompt. And when a friend turned me on to NANOWRIMO (https://www.nanowrimo.org), which is coming up soon, I had written fifty thousand words of an epic story that will be completed October 18th when book three, The Sun God’s Heir: Redemption comes out. *Laughs* You took the NANOWRIMO plunge! I highly applaud your efforts for taking on the challenge of writing a novel in a month. That must have been one supercharged November! When you look back on that November, how do you remember your introduction to characters, outside of your already-formed protagonist and antagonist? The secondary characters showed up when their names were called. Everyone can craft a story. We do so every minute of every day. The story of how I hope this day will go. It has characters in it. Most are familiar, but some are not. They show up when they’re called. Were the events in the novel that were calling out to these secondary characters inspired from things that have personally happened to you? My personal opinion is that it’s not possible to write without doing so. Have I been a pirate in this lifetime? Not that I recall, but the forces apparent inequalities that have animated my life, everyone’s lives, motivate our expression. Just my opinion. *Laughs* There’s always time to become a pirate! Other than getting to experience the pirate life by fictional proxy, what did you really want to communicate to your readers through these words? Were those inequalities of life your reason to communicate, or was it something else? The exercise of power becomes less effective the more we have. What did you love most about sharing your views on power through fiction? I love reading stories. As each word appeared, I enjoyed reading. When you write, the characters do what you think they should. Most of the time. And when they choose to do otherwise, the surprise is what reading is all about anyway. *Laughs* Those pesky characters! Other than learning to move with the ebbs and flows of character behaviour, what else did you learn about writing while dealing with Sun God’s heir? How little I know and how important others are to crafting something worth someone’s time. And how generous people are. What are you currently crafting that will be worth our time to read? Keep that mystery alive by keeping a few of those upcoming cards to yourself. Is that ability to develop mystery what keeps you coming back to write? I was a musical playwright for a number of years. Before that, I worked in many jobs, too numerous to list. From shoveling chicken s–t to owning a small costume jewelry chain, to having a hypnotherapy practice. Each was a different story. I write for the joy of reading. We’ve touched a little about this in the past, but how does your love of the story evolve as you write? What’s in your mind when you’re typing away? I don’t think I do it consciously. I’m a pantser not a plotter. I get into the arena and see where I have to run and from what. So it’s really just sit down in front of the computer and see what happens? I’ve been flip about this before, but getting into the chair is the hardest part for me. Once in the chair, I lose track of time and after five or six hours can barely stand. My wife often has to come up and roust me out of the chair. The old “Once begun is half done,” is more true than not. We tend to argue for our inactivity, making up all kinds of rules and stuff. Sooner or later, if you’re really going to write, you need to begin. I find that if I show up, stuff gets ironed out. Is the ending one of those things that needed ironing? It wasn’t until the middle of the third book that I began to think of the ending. I guess I just trusted that my psyche would help me out, and it did. I kind of knew the direction all the time, just not the details. If I can promise anything, I’ll promise that the ending will be satisfying. I’ll hold you to that promise! Has the use of an external editor helped you work towards that promise? I am fortunate to have a primary editor who is incredible. She turns my sloppy musings into a real book. Kind of like Pinocchio’s father Geppetto. Until she works her magic, my writing is pretty gawky. There are also others, like my wife who makes sure I (my book) don’t go out without clothes on. Have you seen a reduction of sloppy musings and an increase of work with a true author voice as you have continued to write? Like any other activity, confidence seeps in. Has that confidence also flowed through to your author brand, and how you want to represent yourself as an author in the world? The marketing is the hardest part for me because I don’t get the perk of reading the story. It’s also often intangible. I know it needs to be done, and I am limping along, grateful for the help of people like you. Being ADD, my strategy is (Oh, look a bird) to stay focused and listen to the bright people standing around me. Like everything else, it can be done. It’s a learning curve. Don’t expect to know it all in the first application. The good thing about the current self-publishing opportunities is that you can re-do and improve. Make connections. Read Amazon’s how to until you can quote it. A lot of people have gone before making this if not easy then logical. The people who have gone before on the self-publishing journey have left so many wonderful tips to reduce the learning curve for those that follow. I always find it amazing that it really is an attainable goal to become a self-published author! Elliot, is there anything about self-publishing or writing that I’ve neglected to ask you today? Other than money and fame, what do you want from your books? Life is not easy. Not for anyone I know. We all need to take a break. If I can help someone be someone and somewhere else for a minute or two, I win. The gratification that comes from that is wonderful and my way of thanking those writers who have given it to me. Oooh, that’s a fantastic question! I love it so much that I think that I will need to borrow it and add it to these questions in the future! And I love your gratitude towards the writing community! I’m sure you’re keen to return to the wonderful writing community, but you go I’d just like to ask you a few wigglier questions of life to get a glimpse of your opinion of the world. We’ll begin with, why is lemon juice made with artificial flavour and dishwashing liquid made with real lemons? Keeps you from running into deer. It’s dark out there. But do you see the light if you’re moving at the speed of light? Or do you just end up with a deer in the windshield? Why isn’t there mouse-flavoured cat food? I love these. These questions made the whole exercise worth it. You’ve done what I hope to do. How would you know? Who gets to taste it? *Laughs* You wrote an entire book to partake in my round of silliness? I love that you’ve assumed that people are doing the taste testing here. My question to follow that up is does a cat really understand what’s in the packet that they’ve been served up? If we go with the assumption that the cat owner will never taste a real mouse or the mouse flavoured cat food, and a cat can’t complain that the flavour doesn’t match the label, does it matter that cat food label says mouse? Maybe it tastes like chicken, but if the owner won’t verify it, who is to say that we simply don’t have a case of false advertising? *Laughs* Okay, before the rest of the interview descends into a debate of the cat-food world, let’s change gears a little. If you invented a monster what would it look like and what would you call it? Fear. It’s a chameleon most often dressed in the things and people we love. Its alter ego is loss. Oooh, I like that you’ve extended on the answer to have a monster and its alter ego. It kind of makes it feels a little like Jekyll and Hyde. Are you left or right-handed? You mean after I clean up. Are you still able to clean up at this stage? Or are you so far gone that cleaning up is someone else’s responsibility? Ooh, here’s a good one for you, if nothing ever sticks to TEFLON, how do they make TEFLON stick to the pan? It’s a good idea, but I’m not about its long-term durability. If you ate pasta and antipasto, would you still be hungry? LOL! Or would you just explode? I’m thinking that explosion could be on the menu. Although after you’ve seen someone exploding from overeating I doubt there are going to be many menus in your near future… Moving our minds away to something a little more appetizing, what is your favourite word? Virtually. Makes me laugh every time I hear it. *Laughs* I can’t see how the word virtually is funny at all, but knowing you think it’s funny has made me think that it’s funny. We’re virtually at the end of our explorations into the world of writing and wonder today, so Elliot, can you leave us with a nugget from your novel to inspire readers to explore the world of the Sun God’s Heir? The cannon fired its deadly gift — grapeshot, small balls and scraps of iron strung together like evil pearls reaching out to grace the throat of the enemy mast and bring it crashing to the deck. With a violent crash, we end today’s chat. Elliot, thanks so much for returning to chat about the ‘Return’ the first instalment in ‘The Sun God’s Heir’ series, and I hope to catch up with you again soon to follow the progress of the heir.